Ah ha, yes, ah ha, training has started! Have I mentioned that? And I've celebrated by hopping a plane to Seattle for a wedding. A wedding that I'm not looking forward to, because I'm evidently the only woman in my demographic who actually hates weddings. So. 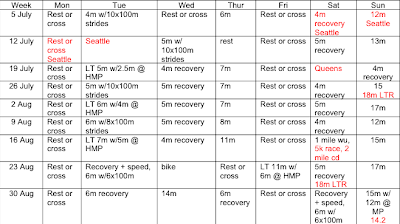 As promised, I'm going to lay out what I have so far in terms of my NYCM training. Basically, my sister looked at my recent mileage and downgraded Pftizinger slightly for me. We'll reassess in a few weeks to modify the plan again. It's definitely a work in progress, so please feel free to offer advice. You can click on it to make it larger and more readable. A few notes: what's in red are either races or schedule modifications, and LTR are the NYRR sponsored training runs. Saturday: 6 lovely miles along the water. Sunday: 12m, also along the water. Monday: The program begins! With a rest. Tuesday: 4.3m with some strides toward the end. The heat was intense and brutal and I went out too fast with the strides, meaning I had to walk in between. Lousy. Wednesday: 6.05m on the treadmill. Oh, man, actually only 5.25m on the treadmill. But I'm counting the .4m each way to the gym because I'm really annoyed that the gym closed before I could finish my 6m run (and I had to sprint to get the last .15m in on the 'mill). Sunday's long run was an interesting one. If you're curious, you can click through to my log (in the upper right on the main page of the blog) where you can see more details than you want to about my run: my mile splits, a map of where I ran, etc. On one hand, we averaged a 12mm pace, which is slightly slower than I'm shooting for. On the other hand, that was with the several generous walk breaks we took the liberty of taking, given that it was relentless sun with temps in the mid-80s (at 9am). Our pace when running was pretty much spot-on 10:30-10:40, which is actually slightly faster than I'm shooting for. Now, if I can only lessen my water breaks, I'll be on the right track. It will be good to do another half again in a few weeks to see where I'm at in a race setting. I am tired just looking at your training! I agree, less walking, but slower running and hopefully a more friendly weather.